A Sicilian grape, making relatively neutral table wines, but best-known as the dominant grape in most of the island’s fortified Marsalas (Vito Curatolo Arini), and the sole grape in De Bartoli’s magnificent Vecchio Samperi. BELOW Retz, in the Weinviertel, Lower Austria. Particularly fine and scented versions of Grüner Veltliner come from this northerly region of Lower Austria, close to the Czech Republic. Grüner Veltliner is a variety indigenous to Austria, where it accounts for nearly 30 per cent of all the vines grown (2015). 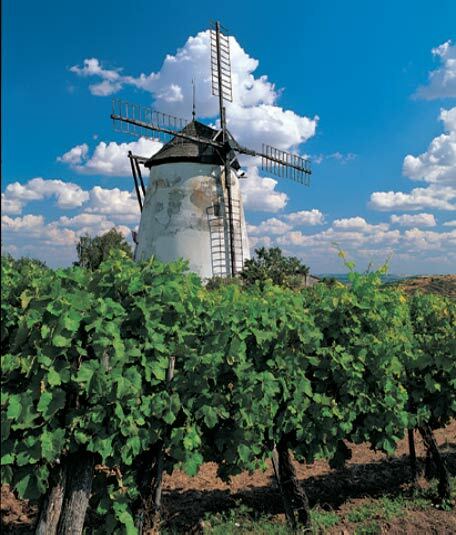 It is mostly found north of the Danube, in the Weinviertel of Lower Austria and, in softer mode, in Burgenland. Most Grüner Veltliner is juicy, unoaked, deliciously fresh, dry wine, often with a touch of spritz*, and marked by white pepper, though, sadly, this telltale aromatic seems increasingly muted today. Finer wines – deeper, firmer, more perfumed – come from around Mailberg and Retz, close to the border with the Czech Republic. The true aristocrats, however, hail from the Wachau. Here the wines often taste of the minerally soils and, whether vivid, bone-dry lightweight Steinfeder (all too rare today), pure, steely, mid-weight Federspiel, or full-bodied, succulent Smaragd, these are wines of real class. Japan’s native grape, mostly grown at the foot of Mt Fuji. 11 to 12% abv, pale, pure, polite, delicate, bone-dry and delightful. Some have a very light astringency, the best have a touch of minerality, and there are the occasional gentle sparklers. Think along the lines of a very slender Chablis or dry Riesling (Grace). ABOVE Portugal, Vinho Verde. 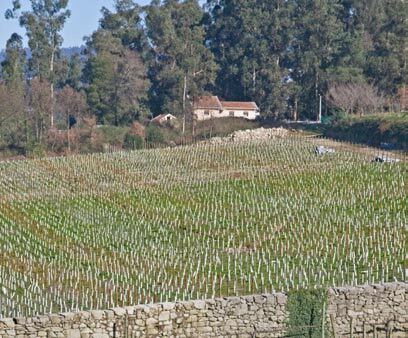 Quinta da Avelada’s newly planted, and mature vineyards of Loureiro, a grape which makes fine varietal Vinho Verde, but which is more often blended with other local varieties. A complex family of grapes which, Madeira’s Malmsey apart (see pp126–7), is mostly associated with Italy. Malvasia is grown throughout Italy, but is especially linked with Latium and Tuscany, and with the Trebbiano grape (qv). It produces dry wines that are low in acidity, high in sugar and relatively neutral in flavour, and therefore benefits from being blended with the crisper Trebbiano. However, its high sugar potential means it lends itself well to sweet wines, of which Madeira’s Malmsey and Tuscany’s vin santo (holy wine) are the most illustrious. Vin santo is made from partially dried (passito)* grapes, Malvasia and Trebbiano, which ferment and age slowly in small wooden barrels for years, to emerge as a golden wine of varying degrees of intensity and sweetness (Avignonesi, Isole & Olena, Felsina). Characterful Southwest France grapes, from the Pyrenees foothills. The finer Petit Manseng is used for the sweet, moelleux, wines. Deep-yellow wines from Pacherenc du Vic-Bilh are sappy, zesty and compact, with an aroma of wax, ripe peach and dried fruit. Many are made by Madiran producers (Laffitte-Teston, Berthoumieu). The best sweet Jurançons, from shrivelled rather than nobly rotten grapes (no fog available! ), are fresh, clear, grapily honeyed and most individual wines (Domaine Cauhapé, Charles Hours, Uroulat, Lapeyre). Rare Rhône Valley grape, also grown in tiny quantities in Australia, California, and in Switzerland, where it is known as ‘Ermitage’. It makes deep-yellow wine, moderate to high in alcohol, low in acid, when it can be slightly thick-textured. It has a bouquet of ripe peaches, almond kernels and sometimes a suggestion of pear drops. Northern Rhône whites are rare, but today most Hermitage, Crozes-Hermitage and St-Joseph are made from a very high proportion of Marsanne (Chapoutier’s Chante Alouette, Grippat’s Hermitage and St-Joseph). In the Goulburn Valley, Australia, are Tahbilk and Mitchelton: taut, dry or off-dry, lemon and honeysuckle wines that need time, and age with great beauty. Switzerland’s ‘Ermitage’ is typically broad, soft, smooth, juicy. Négrette is blended with Bordeaux varieties, and increasingly with Syrah, in the Côtes du Frontonnais, Southwest France. Fresh, gently flavoury, supple, scented, oak-free medium-weights, with a touch of pepper and a gentle blackcurrant fruit. They slip down a treat! (Bellevue La Forêt, Le Roc). The native grape of reds and dark rosés from Italy’s Puglia heel: Salice Salentino, Brindisi, Squinzano and Copertino by name. These are dark, medium-full, vivid, juicy wines; warm, sweet, smooth, gently spicy, often with the faint sloe ‘bitterness’ of the grape’s name. Vallone’s excellent ‘Graticciaia’ is an amarone style. (de Castris, Taurino, Vallone). BELOW: Sicily, Italy. 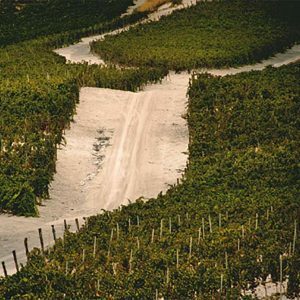 The vineyards of Cusumano, with Nero d’Avola on the sandy soil in which it thrives, and where it is grown low and close to the ground in order to benefit from the heat. is now making its presence felt more in Bordeaux and, if still rare as a varietal, it is grown increasingly, and successfully, outside Europe. White Hall (Virginia), Valdepusa (Spain), L’Aventura (California) will give you some idea, if in very differing styles. S Africa’s crossing of Pinot Noir and Cinsaut (originally called ‘Hermitage’ in the Cape). Its nose can be very individual: gamey, and ‘funky’, sometimes acetone-like, alongside ripe-black fruit. Not to everyone’s taste! Styles vary from medium-full, plump, supple and juicy 13% abv wines, to full, rich, oaky versions. I have enjoyed those from Spioenkop, Kanonkop and Kaapzicht; as well as N Zealand’s Te Awa. Nebbiolo wines are most individual. They combine a di stinctly forbidding structure of acidity and tannin with a scent and flavour of remarkable delicacy. But modern winemaking is rounding off the rustic, rougher edges. Over 97 per cent of Nebbiolo is grown in Italy, where it is limited to the northwest, Piedmont in particular. Here it is the grape used to make Barbaresco and Barolo, east of the Tanaro River and, respectively, north and south of Alba. It also makes tiny quantities of Gattinara, Ghemme and Lessona in northern Piedmont (where it is known as Spanna), and Valtellina in Lombardy (where it is called Chiavennasca). Miniscule pockets exist elsewhere, in Australia, California, Virginia and Argentina, for example. Nebbiolo ripens very late, and gets its name from the autumnal nebbia, mist or fog, that blankets the Piedmontese landscape by the time it is ready to be picked in late October. Typically the wines are high in alcohol, high in acidity and with an abundant, fine-grained, but very dry tannin*; and its moderate colour develops a brick hue after only a few years. The aroma of young Nebbiolo emphasises its sweeter, more fruity side: cherries, plums, violets; with maturity it develops smells of tar, oil, truffles, woodsmoke. These have given rise to the well-known shorthand: ‘tar and roses’. Barbaresco’s image is of a somewhat lighter, more ‘feminine’, quicker-maturing wine than Barolo. But, if there is a kernel of truth to this, individual vineyards and winemaking styles soon blur the distinction. 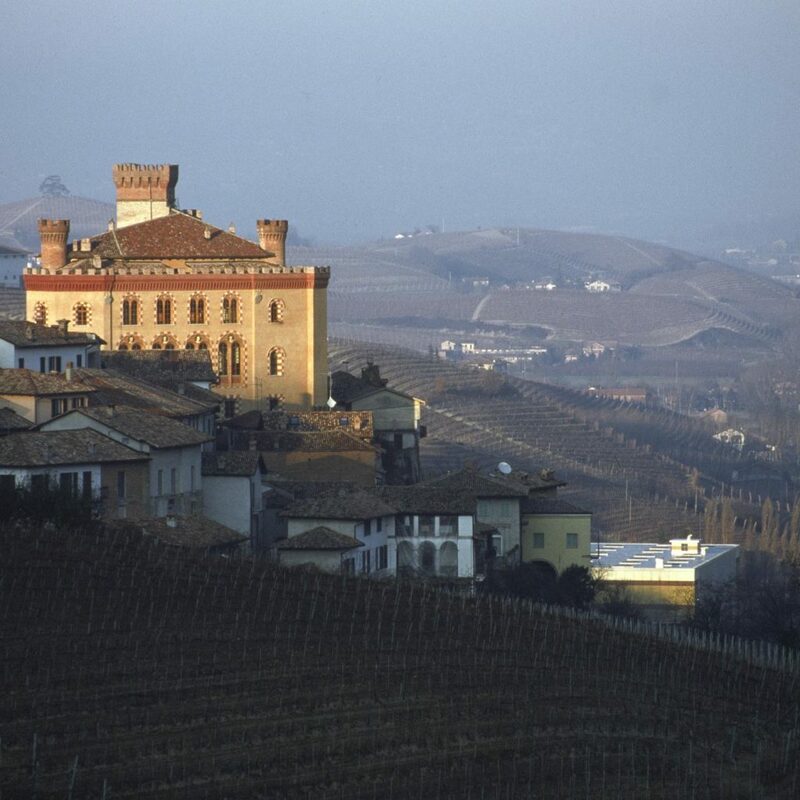 ABOVE Piedmont, Italy: Barolo castle at sunset, late November, after the vines have lost their leaves. Truffle time! Looking at the complexities of the landscape, you can see why there is such interest in individual ‘cru’ wines. But price and pitiful quantities mean that for most of us, ‘straight’ Barolo will have to do, or a good Nebbiolo d’Alba. I won’t complain, though. In the past, producers would tend to blend grapes from different sites to make generic Barolo or Barbaresco. But recent interest in ‘cru’ wines has resulted in a greater awareness of differences of style and quality between individual vineyards (‘crus’), and of Nebbiolo’s ability, like Pinot Noir, to transmit them.